SHADOWHUNTERS - "Raising Hell" - The Shadowhunters will have to put their trust in a Downworlder to access Clary’s memories in “Raising Hell,” an all-new episode of “Shadowhunters,” airing Tuesday, February 2nd at 9:00 – 10:00 p.m., EST/PST on Freeform, the new name for ABC Family. (Freeform/Sven Frenzel) KATHERINE MCNAMARA, DOMINIC SHERWOOD, HARRY SHUM JR. This week we’re talking about “Raising Hell,” including our thoughts on Magnus and Alec, the lack of chemistry between Clary and Jace, and the tension in Jace and Alec’s relationship. TellTaleTV: I thought it was really boring, unfortunately. My favorite relationship is currently the friendship between Clary and Simon, and they were separated for basically all of this episode. I honestly didn’t care much about anything that Clary and the Shadowhunters were doing. Plus, it was all for nothing in the end — Clary’s memory was destroyed, in order to save Jace. The way it happened was very groan-worthy (Alec, why on earth would you break the circle because you were embarrassed?! ), and the whole episode was essentially a big waste of time. Katherine, A Fan: Better than last week’s episode, but it still retains consistent issues of previous episodes. Malec absolutely upped the intrigue this time around. I will say that I’m definitely continuing to enjoy it, regardless of its faults, though. Mortal Instruments UK: I liked it. Compared to the previous episodes, this has to be one of my favourite ones because MALEC. The one thing that annoyed me about the show was the script and in this episode, the lines were fairly good. I know it won’t be this consistent throughout the show but a girl can hope. May I also just mention how Clary was somehow able to kill a Greater Demon with just one stab. A greater demon is one of the most difficult things to do and in the book, nearly all of them got injured killing one. Clary is only just learning how to use a seraph blade and already she’s a professional at it. It just doesn’t make sense. TMI Source: This episode was much better than the previous one, but it still has its work cut out for it. The saving grace of this episode was definitely Magnus and Alec, who are the first pairing that has legit chemistry that made me smile like a schoolgirl. Aside from the memory demon and certain character choices, the episode showed progress. I really enjoyed the lines from the book being incorporated into the show, and I hope to see more of that in future episodes. We So Nerdy: Being a huge Magnus Bane fan, I was excited to see in a larger scale how Harry Shum Jr. was going to bring him alive for the television audience. To me he didn’t disappoint, and the moments that I truly enjoyed from the episode came from lines delivered by Harry. “Raising Hell” wasn’t my favorite out of the episodes we’ve seen so far, but it did entertain me. Fangirlish: I liked it. How can you not like Malec? It’s like every time that they are on the screen – the rest of the world fades away. Harry and Matt have great chemistry and we can’t help but love them. It wasn’t great all the way through, but Malec was amazing. This week we finally saw Alec and Magnus meet. What are your thoughts on the Malec pair? TellTaleTV: This was the only part of this episode I enjoyed! I loved Magnus’ forwardness and flirtatiousness and how bashful and flattered Alec got. That was really cute. Hopefully Alec gets over Jace soon and sees what’s right in front of him with Magnus. Katherine, A Fan: Ohmygod. I don’t know how to cope with how much I love them so far. If the show has nearly nailed anything it’s been their chemistry and introduction. They’re a lot subtler than Clace, which is very much welcomed. I can’t stop smiling about Alec’s genuinely sweet smiles towards Magnus. I could watch those interactions on a loop. Mortal Instruments UK: There could be a variety of ways in which Magnus and Alec could have met and this was one of the decent ways. The showrunner said that the first time we see Alec smile is when he meets Magnus and that’s what happened. It’s as awkward as can be when someone talks to the person they like. But this isn’t what happens in the books so I am indifferent to it. I guess the writers wanted to make it blatantly obvious that Alec liked Magnus and vice versa. TMI Source: It was definitely my favorite pairing of the show so far if only because I can feel it with Malec. It’s something that I haven’t felt with watching Clary and Jace – that chemistry – trust me, I want to, they’re my favorite pairing in the book, but it’s just been lacking. But Magnus and Alec, while it wasn’t much interaction, had that instantaneous spark, and the show teased what could be between the two in the future, which I’m intrigued to see play out. We So Nerdy: I am ALL for the Malec pair. Magnus with his wit and appeal can hopefully remove the massive chip on Alec’s shoulder. I look forward to see how SHADOWHUNTERS develops their relationship. Fangirlish: The thing is you can feel the chemistry between Alec and Magnus. I love that. I want a slow burn with the two of them – but nothing like where they have someone else come between them. I want to see them get to know eachother. I want to see them evolve. We saw the return of Magnus this week after a two-episode absence. What are your thoughts on Magnus? TellTaleTV: Magnus is super hammy and over the top, but I really like him. Harry Shum Jr. is clearly having so much fun with this role. Some of the things he says are ridiculous (that Dead Sea line was a bit much), but he’s fun. He’s definitely a character. And like I already said, I really want him and Alec to get together like NOW! So far he’s been the only one to get Alec to crack a smile. Katherine, A Fan: There’s all this talk about how Magnus is the strongest Warlock with immeasurable power, yet we don’t really see that. The way his powers have been displayed so far, his magic isn’t as undefeatable as we were led to believe. Plus, book Magnus wouldn’t be as flimsy in fights as we’re seeing him now. With that said, I love the way Harry Shum is portraying his quirks and personality. Mortal Instruments UK: I liked Magnus’s flamboyance in the show and Harry in my opinion did a great job as Magnus. But the one flaw I didn’t like about his character are his powers. He is the most powerful warlock yet he didn’t use his powers to just take the necklace from Jace with ease, he negotiated with him instead. I need to see Magnus being the mighty warlock that he is. TMI Source: While Magnus is a character that we don’t get too much of in the first book, I’ve enjoyed having him on my screen when I do. Aside from the whole running away thing, Magnus has been one of my favorite faithfully portrayed characters on the show next to Simon. There’s also something that Harry Shum Jr. brings to the role that is really incredible to watch. We So Nerdy: I LOVE, LOVE, LOVE Magnus and I truly ADORE Harry so I’m extremely bias in my opinion. I just think Harry is fantastic in this role and I can’t wait to see more of Magnus throughout the season. I also adored that Harry brought a bit of his dance abilities into the role; I love those spirit fingers and hip shimmies. Fangirlish: In my opinion – Harry did a great job as Magnus. I have a few issues – because I want to see Magnus exert his power, to be the all powerful warlock who lets nothing stand in his way. 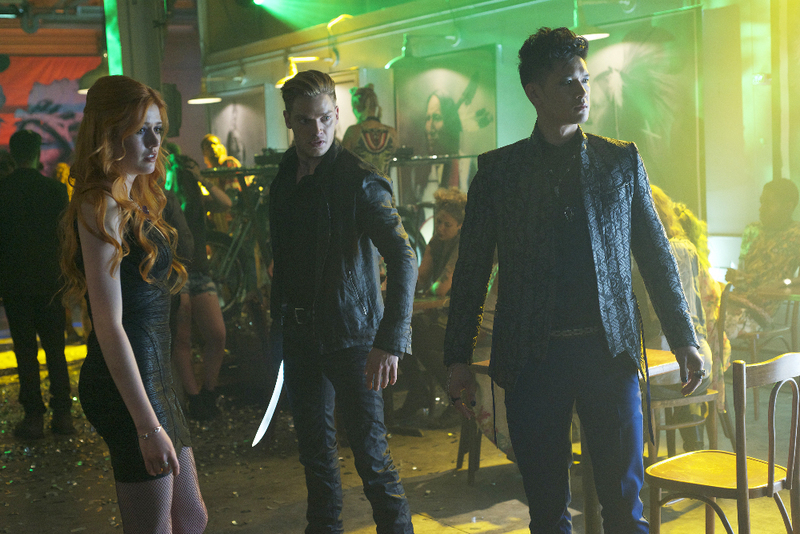 Jace and Alec continue to deal with tension in their relationship. How much longer do you see this going on, and what would you like to see from the Parabatai moving forward? Katherine, A Fan: Until Clary does something great enough to justify as least some amount of trust with Alec (i.e. saving Izzy or Jace when he couldn’t) then it’ll be awhile. Alec has legitimate reasons why he can’t trust Clary and Jace will never understand or be okay with his feelings about her. I’d like more scenes where we can see the parabatai bond at work. While the parabatai tracking itself was odd, that scene really functions well because there’s not an ounce of dialogue. It avoids the faltering interactions while building up the visual strength of their bond. Such loaded stares! Mortal Instruments UK: I really hope not for long because I don’t like the arguments that they keep having. Jace and Alec seem like they are in conflict even before Clary showed up and eventhough they say they are ‘parabatai’, it doesn’t seem like they are. I don’t sense the brotherhood that they are supposed to have. TMI Source: I haven’t read the first book in a while, but I do not remember Jace and Alec fighting this much. We know why the tension is there – Clary’s arrival and Alec being forced to confront his feelings for Jace in a very direct way. But one of the ideas behind being parabatai is being there and forgiving for your partner no matter what, which we’ve seen. While I understand the tension, I want to see more of Jace and Alec supporting each other, which we’ve seen but not nearly enough. The show has proven when we see Jace and Alec at their supportive best that it’s truly special. We So Nerdy: I just need these two to really hash it out and get to the root of the problem: JEALOUSY! I do believe there is some mistrust on Alec’s part when it comes to Clary, but I feel the majority of it has to do with Alec being a bit jealous of Jace’s feelings towards Clary. Alec may not realize this yet, but it is there. As parabatai you rely on each other so much and the trust factor must be solid so you can properly protect one another. Also, Jace needs to show some vulnerability in their relationship, the buck doesn’t always stop with him. Jace needs to remember they are a team and act accordingly. Fangirlish: I don’t like the arguments that keep happening. I feel like yes – they are going to argue. BUT – we are missing the connection that the two are supposed to have. Their relationship is supposed to be able to overcome anything and we know that it will – but don’t like seeing this. One of the concerns from the beginning has been the relationship between Clary and Jace and how it hasn’t really evolved as far as chemistry. Do you feel a spark between them? TellTaleTV: Not even a little bit. I’m not really sure what the exact problem is; they’re just not gelling, for me. I’ve said it before and I’ll say it again: Katherine McNamara (Clary) and Alberto Rosende (Simon) have tons more chemistry. Dominic Sherwood is super attractive but unfortunately he is not terribly charismatic (not with Katherine McNamara, at least). Katherine, A Fan: There have been moments between them that have worked well. The ‘someone’s looking badass’ moment works well. Also, Jace helping Clary when she’s saving the child warlock (because apparently those exist in this incarnation? ), they have a quick quip. It’s the small reactions like with Clary walking in on Jace shirtless that work the best. Kat performs those surprised and innocent scenes so well. What’s really working against them is their dialogue, especially Jace’s. A lot of his jokes fall flat, so his charms don’t quite work as well either. It’s a shame, because I think that there would be more chemistry if their personalities lined up more authentically in the scripts. Mortal Instruments UK: Oh gosh don’t get me started on Clace. This is the one of many things where I prefer the book over the show. When I read about Jace, I instantly fell in love with him and his relationship with Clary. I basically fell in love with Clace. However in the show, I feel nonchalant about their relationship. I can’t put my finger on it but I don’t see a spark. This is what I feel about them and I know some people disagree but this is my opinion and interpretation. TMI Source: Here’s the thing, I absolutely love Clary and Jace. They are my favorite pairing in the books, but there’s been something inherently missing between them in the show and that’s been a spark. From the show’s pilot I’ve felt the show wanting me to embrace them, but I haven’t been able to completely because of that something missing. When it comes to shows when I ship something I know it, but I’m not feeling it right now. Chemistry isn’t something that can be fixed, but perhaps the show can find a way to salvage what’s supposed to be the show’s core pairing. We So Nerdy: Chemistry between Clary and Jace… No, nope, naw! I just don’t see it and I am not sure it will come. You either have chemistry or you don’t, and for those actors who don’t, they need to have the talent to combat this and act in a manner that makes it believable. I just don’t feel that Katherine McNamara and Dominic Sherwood have this skill set in their repertoire yet. Fangirlish: I don’t really feel any chemistry between the two. I feel like this is another time where I miss the book more. I miss the funny, sarcasm of Jace. I feel like it’s lacking. This isn’t a reflection of the actors – it’s just something is missing. I am indifferent to their relationship in the show. It’s clear that we’re headed straight toward Simon becoming a vampire — probably even in this next episode. What are your thoughts on this rushed story arc? TellTaleTV: It’s definitely fast, but I have no background with the books so I can’t really compare. As long as it’s done well, I’m interested. It’s easily the most surprising/unexpected thing the show has done so far, so I can’t help but be intrigued: will being a vampire change his personality? How will this effect his relationship with Clary, and his interactions with her fellow Shadowhunters? Katherine, A Fan: I’m glad that they’ve at least spread out his transition over the course of a few episodes. Let’s be real, it could’ve been even quicker than it is. I’ve really enjoyed watching Simon discover the hints of change here and there throughout the last couple of episodes. Am I happy that he’s turning this soon in the series? No, but at least it’s slowed down slightly until he returns to the Hotel Dumort in the next episode. Mortal Instruments UK: Not really a fan. I would love to see more mundane Simon in the show and wouldn’t mind if he turned into a vampire at the end of the first season maybe but this is too soon. I don’t know what the story is in terms of what happens after he is a vampire but we’ll see. Note about Maureen: I really liked her character and her awkwardness in telling Simon she liked him. TMI Source: I understand where the show is coming from in rushing this storyline for Simon. Before Simon becomes a vampire in the books he serves a purpose for supporting Clary and without any storyline of his own. So in pushing this storyline into motion so soon I can understand why the show is doing the vampire storyline so quickly. But I’m still not a fan of the rushed nature of it all because it’s the product of one of the weak points of the show: the pacing. There is plenty of material to explore and plenty of time to do it, so the show needs to stop sprinting. We So Nerdy: Altered story arcs don’t bother me with adaptations/interpretations, unless it is killing off a character that doesn’t die in the original material or significantly altering the personality of a character. So making Simon a vampire earlier in the TV series doesn’t bother me. I just hope that when it occurs that it flows well within the material. Fangirlish: Too much, too soon. Build the world. We are rushing some peoples development and not developing others. It’s sad. Would you say this week’s episode was an improvement from last week’s? TellTaleTV: Nope, last week’s was better, I think. This week was super slow and honestly kind of boring. The team’s little adventure with Magnus was a total non-starter. In fact, it set them behind instead of propelling the story forward (they’re farther away from uncovering Clary’s memories, find the Mortal Cup, and rescuing her mother than ever). I also don’t understand why Luke keeps popping up for no reason at all! Either do something will him now or stop showing pointless glimpses of him. Katherine, A Fan: Improved, but not greatly, unfortunately. The dialogue is still falling flat and the character’s intentions don’t line up, as they should. Alec’s finally verbalized why he hates Clary so much and it helps us understand that tension so much more, I just wish that we had gotten it sooner. Mortal Instruments UK: It was definitely an improvement and better than last week but it isn’t great either. There’s something missing and askew about the show – I am not connected to the characters in anyway. I truly hope that it gets better. TMI Source: I would definitely say this episode was an improvement from last week’s episode. Overall the execution of it all was well done although I still have my issues with it, but that’s because it’s my job to critique the show. But introducing the Malec pairing this week was definitely one of the highlights that did really great things for the show. It’s episodes like this – and not “Dead Man’s Party” – that gives me hope that this show can save itself. We So Nerdy: To me each episode improves a bit more because we see these characters we love from the novels come to life each week. Nothing stirred me as much as episode 1, “The Mortal Cup” because it was the beginning of this new adventure, but as I mentioned in the past roundtables I wasn’t expecting miracles and sitting down to watch SHADOWHUNTERS gives me a moment to escape the humdrum moments of my life and retreat into this fictional world for a bit. What would you like to see from the show moving forward? TellTaleTV: They really need to get a handle on pacing. Last week’s “Dead Man’s Party” was fun and decently well-paced. Stuff happened! Some of it was exciting! This week was terribly blah. Also, the dialogue has improved, kinda, but every once in a while they come out with an incredibly cheesy line that just makes me cringe, so they need to work on that for sure. I would also love to see the chemistry between Clary and Jace improve. I know that “Clace” is a huge ‘ship, so there’s no way that the show will totally abandon the books and drop them. But in order for it to work, they’re going to need to (1) actually get to know each other and (2) start vibing. I’m not really sure how to force chemistry, but they need it, asap. Katherine, A Fan: Improved scripts and more definitive, consistent character behaviors are a must. I’m endlessly hopeful for future episodes and will continue to watch regardless of how outlandish things become. Bringing this world to life (again) is surreal and I’m going to devour it for as long as it continues. TMI Source: It’s simple: progress. And that stems from a variety of things all of which are already set in stone seeing as the first season has already been filmed. But I want better writing, better dialogue, better portrayal of characters, etc. I hope to continue to see this show progress and get to a place where it’s a show that I can enjoy as a separate entity from the books. We So Nerdy: I want to see where Malec goes, how Alec and Jace will repair their relationship and the role Isabelle will play in this, and how Simon will make his full transition to a vampire. But I really look forward to Clary and Luke interacting and Clary learning the truth about Luke. Fangirlish: I believe in this show. I want to feel a connection to the characters. I want to believe in them the way I did in the books. What are your thoughts? Join in on the discussion! What do you think about Alec pulling away from the pentagram? A lot of fans have been arguing over this, and I wanted to know your opinion on it. Personally, I don’t think they’re giving him enough credit. Although he was afraid of being outed, he’s smart enough to know that he’d be risking everyone else’s lives. Besides, it’s not surprising that he saw Jace; that’s his parabatai. Their bond goes beyond friendship; surpasses even brotherhood. Anyway, that’s my two cents on it. I thought you’d have a good perspective on this, because your reviews of the show have been spot on (in my opinion lol). I don’t want to start a fight in the comments, because this has kinda been a hot topic in the fandom but I like hearing other people’s thoughts on things like this, even if I don’t always agree. I love Magness, and I think Harry is doing a good job with what he has. I’m not seeing much of Magnus’s humor though, and I want it back. In the book he made me laugh more than any other character, and I’m not really seeing that pretrade in the show. Oi, TelltaleTV: Embarrassed? He was much more than embarrassed. He was being forced to come out! That is incredibly hard, especially because Alec has been raised thinking that being a gay shadowhunter is wrong and that he could be punished for it (when Edmund Herondale fell in love with a mundane girl he was beaten, stripped of his marks and thrown out of the clave). He was terrified. As someone who was forced to come out well before I was ready, I can confidently say I would’ve broken that damn bond. So that’s my opinion on that. I agree with you. Sometime people need to stop judging TV and book characters so hard and try being on their shoes. If you have on demand, the commercials there are even shorter. Cool! Thanks for the info. Commercials today are just hideous and so long. You end up watching more of those than the show you’re trying to watch.